Guernsey cyclist Tobyn Horton is wary of making too many demands of himself physically as the Tour Series goes on. The 28-year-old is riding for Madison Genesis, who are currently top of the overall team standings. The series features 10 events, the next in Aberystwyth on Friday, before reaching its climax in Bath on 11 June. "While they're not the longest races, there's also the travelling which takes its affect and you do become fatigued," Horton told BBC Sport. "We've got three rounds next week, and the following week, so it will catch up, so you will need to say 'can I have a rest', and they'll call on someone else." 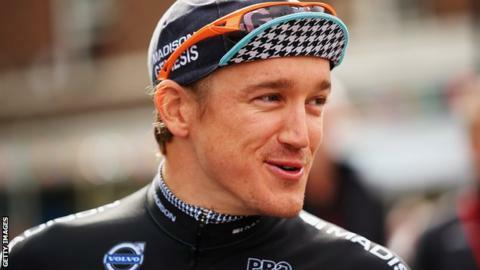 Leeds-based Horton missed out on last year's Tour of Britain race because of a virus. Friday's third round features a mile-long hill climb in Wales. "Nobody's done it as part of the series before so it might change some of the team's tactics, but I think it'll suit us as a team," said Horton. "There's quite a lot up for grabs so you can never be complacent. With the rules as they are, if you have an unlucky night you're on the back foot." Following the Tour Series, Horton will be taking part in the Island Games, which begin in Jersey on 27 June. "I've not been back to Guernsey for the last six or eight months, but I'm hoping to go home after the Island Games and have a few days chilling out," he added.